Israel’s Arrow scores first operational hit — but against what? TEL AVIV, Israel — In the aftermath of Israel's early Friday morning airstrikes against Hezbollah targets in Syria, the country's Arrow anti-ballistic missile scored its first operational intercept — but against what, experts here are asking? What is known of this unusual story is this: Israel's Super Green Pine radar — part of the joint U.S.-Israel Arrow weapon system — detected a threat and launched an Arrow 2 interceptor against its first operational target. Evidence of this is clear from the Israeli Home Front alarm sounded throughout the southern environs of Jerusalem and the Jordan Valley; as well as pieces of the Arrow 2 rocket engine found and photographed in Jordan. From an official Israel Defense Forces statement released early March 17, we know that the Israeli Air Force targeted "several targets in Syria" and that, following the mission, "several antiaircraft missiles were launched from Syria." The IDF reported that its "aerial defense systems intercepted one of the missiles" and stressed that "at no point was the safety of Israeli civilians or aircraft compromised." This statement, too, is unusual in that as a matter of policy, the IDF has not publicized the periodic strikes it carries out in Syria to prevent high-value weaponry from crossing the border into Lebanon for Hezbollah's possible future use against Israel. The only Israeli operations in Syria that are publicly acknowledged and announced by the IDF pertain to aircraft, tank and artillery strikes in response to fire from Syrian territory quite close to Israel's border. Today’s statement made no mention of retaliatory strikes, and an IDF officer confirmed to Defense News that airstrikes were against "strategic assets of Hezbollah" far north of the Israel-Syria-Jordan border. Israeli media reported Friday morning that the strikes were aimed at arms convoys in Syria’s Homs District, not far from Palmyra, a formerly Islamic State group-held city retaken earlier this month by Syrian regime forces with backing from Russia. 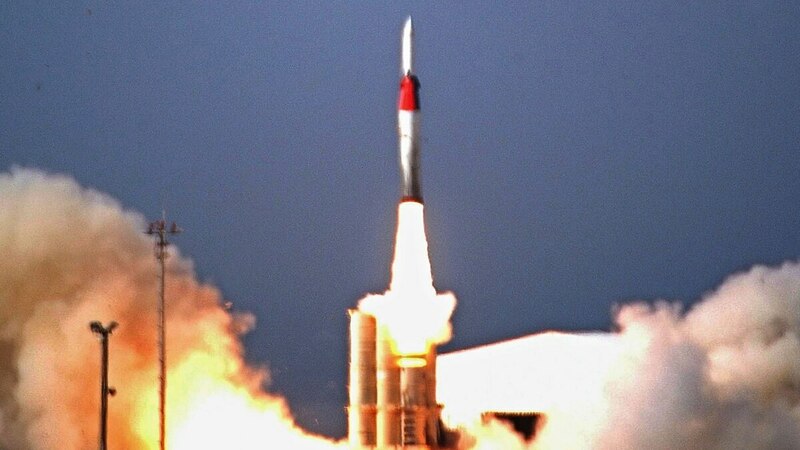 Israeli media are reporting that the Arrow intercepted an SA-5 surface-to-air missile, or SAM, and indeed it is logical that Syria’s air defense system launched against the intruding Israeli fighters in an attempt to down the planes. But given that the Israeli attack was hundreds of kilometers away from Israeli territory, why would Israel launch Arrow, which is intended to defend the homeland? The SA-15 or any other Syrian or even Russian SAM would not have posed a threat within Israel. And in any case, Arrow is not designed to intercept SAMs. Such anti-air missiles are not part of the system’s database, which automatically tracks trajectories and predicts impact points of incoming ballistic missiles. Once fired, an SA-5 with its four strap-on boosters create five targets in the air, all of which appear as tumbling objects whose trajectories — unlike those of ballistic missiles — are practically impossible to predict. And even if the Arrow system’s early warning and tracking radar mistook fragments of the SAM as a ballistic target, where is the debris, experts here are asking? A more likely scenario, several experts here said, is that the Syrian regime was so incensed by yet another successful Israeli air attack on its soil that it fired off a Scud-type ballistic missile to make a point. Perhaps their point was to warn Israel against future incursions into its territory. Or, in light of last week’s meeting between Israeli Prime Minister Benjamin Netanyahu and Russian President Vladimir Putin aimed at coordinating strategic interests and actions in Syria, perhaps Damascus felt the need to protest too much clarity between its Russian patron and its Israeli enemy.